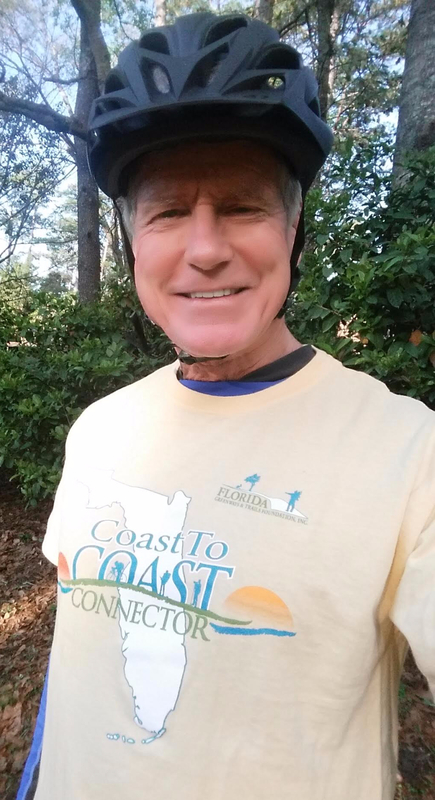 T-shirt, available to donors who join the trail movement by giving $200 or more to the Florida Greenways & Trails Foundation. Key West to Miami. Tampa to Naples. And of course, St. Petersburg to Titusville. 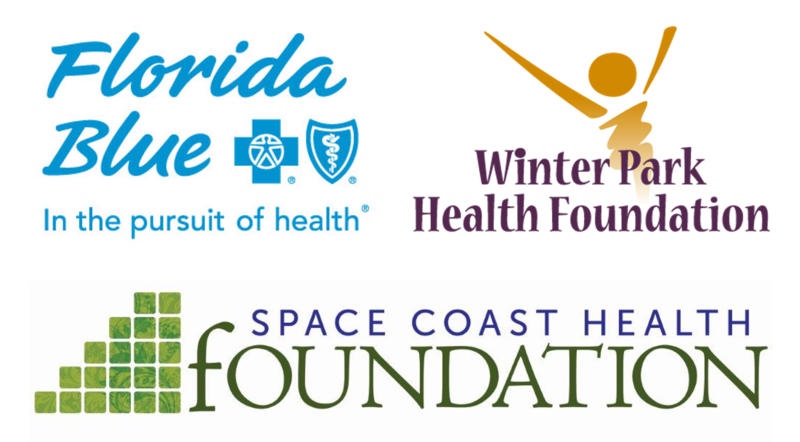 The future of Florida’s transportation is traveling between these destinations and more on two wheels or two feet via off-road paved trails. Thanks to the visionary leadership of many local communities and elected officials, regionally connected trails like the C2C are becoming reality throughout the Sunshine State. Gaps between recreational trails are being closed everywhere you look. Visit our website to make a personal contribution. Gifts of $200 or more will be recognized in this newsletter and you will receive a free C2C T-shirt. Join me and be a part of the trail movement that will make our state the most welcoming destination in the world for cyclists, equestrians, long-distance runners, hikers and paddlers, families and nature lovers. Say this for trails – they are fast becoming one of the economic tools to boost spending, grow jobs, and fill the coffers in tax revenues for cities and counties. The numbers don’t lie. You can thank Florida trails and outdoor recreation for 330,000 jobs, $38.3 billion in consumer spending, $2.5 billion in state and local taxes, and $10.7 billion in wages. And we are just getting started. Imagine the tourism dollars from bed and breakfasts, restaurants and eco-tours once the C2C is complete. Millions of people from all over the world will flock to the Sunshine State to experience both pristine beaches and rocket launches from the seat of their bicycles. Which of the seven C2C gaps will be completed first? If you answered Starkey, you’re right. By late 2017, trail lovers of all ages will be riding or hiking from St. Petersburg to Brooksville. 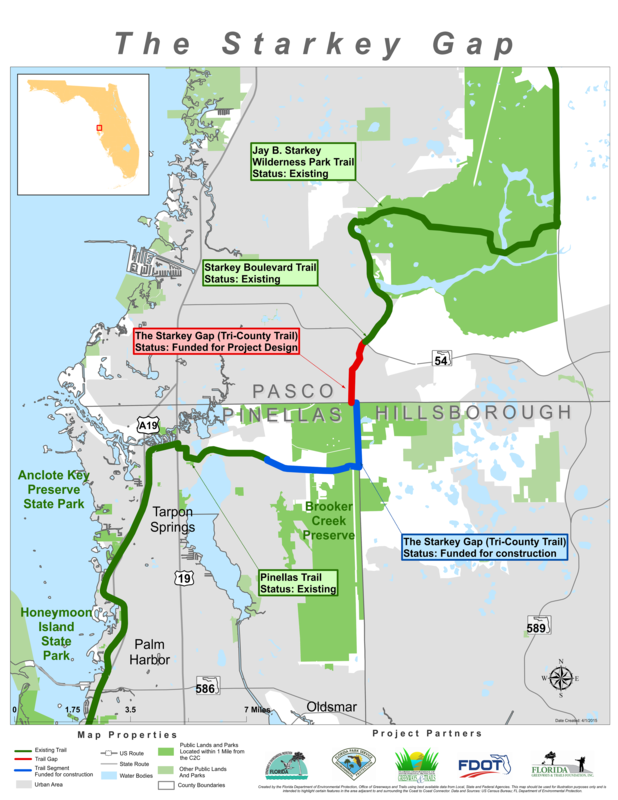 Filling the 7-mile gap between existing trails in Pinellas and Pasco Counties will create the longest trail in Florida at roughly 113 miles. How? Starting on the west coast, the C2C Starkey Gap links the 52-mile Pinellas Trail with the 6-mile Starkey Wilderness Trail and 6-mile Starkey Boulevard Trail, allowing you uninterrupted access to the 42-mile Suncoast Trail. As if that wasn’t enough, this section will allow trail users access to the Brooker Creek Preserve, an 8,700-acre sanctuary of wild Florida beauty. The trail is going to be so close to nature planners are adding special rustic fences designed to keep cattle off of the path. You will want to plan for extra time during this portion of your trip to look for deer, turkeys, eagles, and all of Florida’s natural wonders. The countdown to Florida’s longest regional trail has officially begun! A new, reoccurring column to highlight the “must-experience” places along the C2C trail. Have a place for us to feature? Email Coast2CoastConnector@gmail.com. One minute you are riding by restaurants and retail shops and the next minute you can see nothing but trees and natural landscape. Welcome to Pinellas County, where your trail experience begins on the very urban Pinellas Trail and transforms into an old Florida wildlife encounter as you arrive at the 8,700-acre wilderness island known as the Brooker Creek Preserve (BCP). A refuge for native plants and animals, the BCP is your chance to get up close and personal with nature. Think otters, gopher tortoises and bobcats roaming around a maze of swamps and pine flatwoods. It’s a refuge for us too – an escape from the hustle and bustle of everyday life. On your 250-mile trek from coast to coast, the BCP is a for-sure sun-sational experience. Spend a day, take pictures of wild turkeys and white-tailed deer, and discover our state in its natural state. The menacing clouds hanging over Brevard on a recent Saturday were not a deterrent to a chance to ride another portion of a bicycle trail I had not visited in many years. I headed to Winter Garden hoping the rain would hold off. It was a chance to exercise, but also another opportunity to enjoy the outdoors, explore new areas, ride through quiet rural communities under a canopy of trees or to look around a town like Winter Garden. I have enjoyed exploring some of the paved paths as well as the rough dirt trails and abandoned railroad beds that twist through the state, and eventually will become the Coast to Coast Connector, linking the Gulf with the Atlantic. Imagine cycling or hiking on a trail from St. Petersburg that traverses the middle of Florida on its way to downtown Titusville before ending at the Canaveral National Seashore. 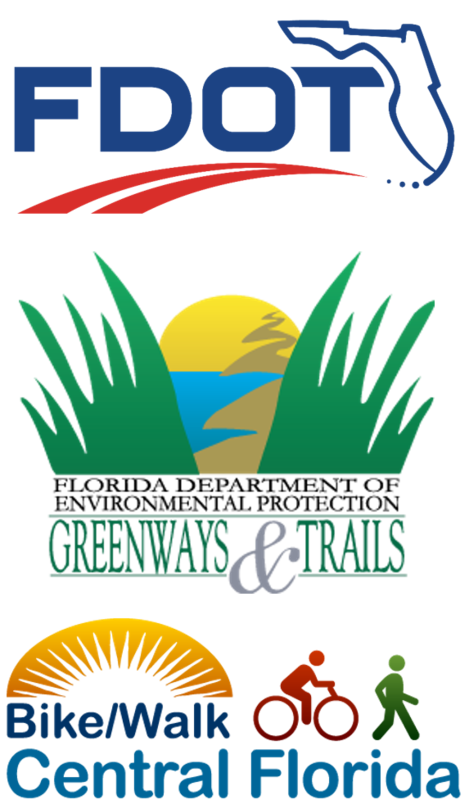 “This is really a project whose time has come,” said Dale Allen, the executive director of the Florida Greenways and Trails Foundation. The estimated 250-mile trail – known as the Coast to Coast Connector, an enterprising state project to build a path for cyclists and hikers from the Gulf of Mexico to the Atlantic Ocean – is getting closer to reality. It’s almost 75 percent finished, except for gaps totaling about 66 miles. Dozens of people gathered at the Clermont Trailhead Thursday morning for a ribbon cutting and dedication of the newly completed expansion of the South Lake Trail and the new pedestrian bridge along Lake Minneola, about a quarter-mile from Lake Hiawatha Preserve. The expansion, in its third phase, is over 3.5 miles long and runs from Silver Eagle Road to the Clermont Trailhead. 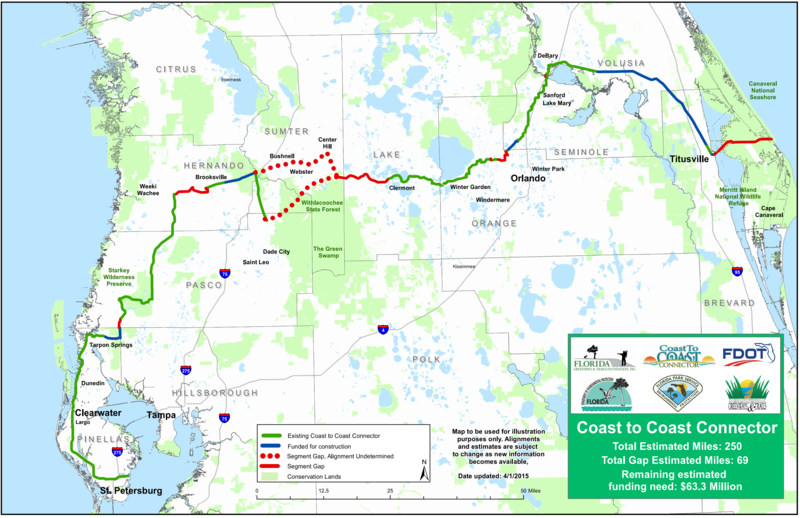 The highly anticipated trail segment is part of the Coast to Coast Connector a bicycle trail running from St. Petersburg through Orlando to Cape Canaveral. South Lake County continues pedaling up the path of bicycle-friendly notoriety, with one more designation now under its belt as the 2014 Bicycle Friendly Community of the Year. The Florida Bicycle Association bestowed the South Lake Chamber of Commerce with the honor just days before Gov. Rick Scott proclaimed March as Florida Bicycle Month. The Florida Department of Transportation took a step closer to having a world-class trails network that stretches from the Gulf of Mexico to the Atlantic Ocean with the kick-off of the South Sumter Connector Trail Feasibility Study. The feasibility study will evaluate a 20-mile segment of the proposed C2C Trail, primarily within Sumter County. The segment is being called one of the largest gaps in the project. Pedaling to Eco-Tourism Success, a summit on cycling and trails, recently attracted a full house to Clermont’s City Center. They discussed the Coast to Coast connector, a 275-mile bicycle, walking and hiking trail spanning from Cape Canaveral to St. Petersburg. Once finished, the trail will be the longest continuous bike trail in Florida and one of the longest in the nation. From Clermont, bicyclists will be able to pedal 101 miles to the Atlantic Ocean and 101 miles to the Gulf of Mexico. More than 70 bicyclists and hikers were “First on the Trail” of the Space Coast Connector in north Brevard County. The group joined FLORIDAY TODAY, Space Coast Transportation Planning Organization and Brevard County Parks and Recreation to explore a seven-mile section of trail that will become part of the Coast to Coast Connector. Walking along the sandy trail cut through what can only be described as a slice of old Florida, I was immersed in thoughts of what it might someday become. Small town turned to rural; rural become woodlands; and the woods began to resemble what I imagined Florida once looked like, before civilization overtook the land. It was a 30-minute ride into our past to look into the future – and it was simply gorgeous. More to the point, it was a bus ride to the starting point of a walk and bike ride to what two years from now will be part of the Coast to Coast Connector, a trail that will run 250 miles across the state from Brevard County to St. Petersburg – the Gulf of Mexico to the Atlantic Ocean. It will be the only such trail in the nation. The Florida Department of Transportation District Five is conducting a study to evaluate potential alignments for a proposed multi-use trail facility, known as the South Sumter Connector Trail, which will link the Withlacoochee State Trail to the west and General James A. Van Fleet State Trail to the east. The study will assess the feasibility of two conceptual trail alignments through Sumter, Hernando, and Pasco counties. This analysis will investigate the potential environmental impacts for the proposed trail alignments and will examine ways to avoid or minimize those impacts.